I love cooking Angle Hair pasta. Not only does it taste good, but also quick to get it done, especially on a hectic day. The Angle Hair pasta I used in this recipe is fantastic, that only needs two minutes to cook until al dente. This dish Meatballs with Angle Hair Pasta is my daughter’s favourite. When it comes to cooking this quick dish, it won't take too long to prepare fresh meatballs. Sometimes I just use the meatballs that cooked in advance and kept in freezer. Then grab them out to cook in the last minute. 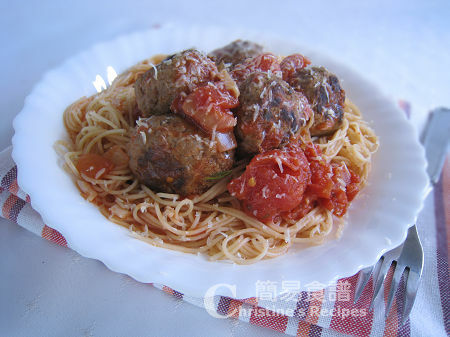 The pasta absorbs all the flavours of the sauce, going really well the juicy meatballs. Mix minced beef with marinade and leave for 15 minutes. Spoon out mixture and use two palms to shape balls. Heat oil in a frying pan or saucepan over medium-high heat. 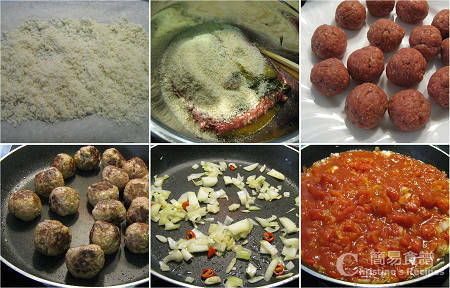 Add meatballs and cook, turning occasionally, until well browned and cooked through. Set aside. Add some more oil to sauté garlic and chili until aromatic. Stir in basil and add diced tomato with sauce. Bring it to a boil. Slower heat and simmer for 10 minutes until sauce thickens. Sprinkle salt and pepper to taste. Meanwhile, use a large saucepan to prepare boiling water. Add salt in water. Follow the instructions on the packet to cook Angle Hair pasta. Mine only needs two minutes of cooking to al dente. Drain well and toss to combine with meatballs and tomato sauce. Serve hot, topped with grated Parmesan cheese. The breadcrumbs are to help the beef stick together. I only used 3 slices of white bread, trimmed crust. Dice and process them in a food processor. Then pop them in a preheated 160C (320F) oven for a few minutes. The baked breadcrumb is wonderful for mixing meatballs. Chili and tomato are “good friends” to make your pasta taste heavenly. I bought the canned Italian tomato with sauce at supermarket. Very handy. Lovely pasta with meat balls!! i love that you aded rosemary, fresh oregano & mustard to the meat balls! Strangely enough, I've never once made meatballs. I don't know why, because I love them! Your recipe has inspired me to make them & hubby gave it a thumbs up! should i use mustard powder or mustard sauce? I love angel hair. When I run out of mee hoon or rice vermicelli, I would use angel hair. Your dish here with meat balls looks very delicious. Your meat ball looks very yummy.